To investigate, among women with breast cancer, how postdiagnosis diet quality and the combination of diet quality and recreational physical activity are associated with prognosis. This multiethnic, prospective observational cohort included 670 women diagnosed with local or regional breast cancer. Thirty months after diagnosis, women completed self-report assessments on diet and physical activity and were followed for 6 years. Cox proportional hazards models were used to estimate hazard ratios (HR) and 95% confidence intervals for death from any cause and breast cancer death. Women consuming better-quality diets, as defined by higher Healthy Eating Index-2005 scores, had a 60% reduced risk of death from any cause (HRQ4:Q1: 0.40, 95% CI: 0.17, 0.94) and an 88% reduced risk of death from breast cancer (HRQ4:Q1: 0.12, 95% CI: 0.02, 0.99). 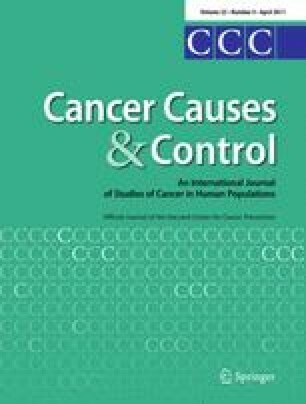 Compared with inactive survivors consuming poor-quality diets, survivors engaging in any recreational physical activity and consuming better-quality diets had an 89% reduced risk of death from any cause (HR: 0.11, 95% CI: 0.04, 0.36) and a 91% reduced risk of death from breast cancer (HR: 0.09, 95% CI: 0.01, 0.89). Associations observed were independent of obesity status. Women diagnosed with localized or regional breast cancer may improve prognosis by adopting better-quality dietary patterns and regular recreational physical activity. Lifestyle interventions emphasizing postdiagnosis behavior changes are advisable in breast cancer survivors. We would like to thank Dr. Charles L. Wiggins, HEAL Study managers, Eric Meier of the Fred Hutchinson Cancer Research Center Nutrition Assessment Shared Resource, Todd Gibson of Information Management Systems, and the HEAL Study participants. This study is supported by National Cancer Institute Grants: N01-CN-75036-20, NO1-CN-05228, NO1-PC-67010, and T32 CA105666. No conflicts of interest or disclaimers to report.